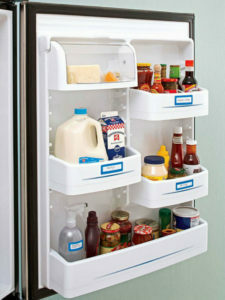 Let’s jump right into this fabulous yet brilliant organization and storage ideas for your fridge. Don’t you just love organizing. 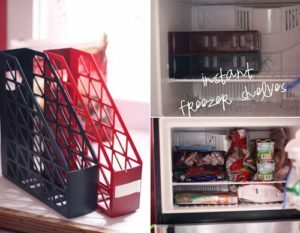 Here I gathered some Brilliant Fridge Organization Ideas for your home. 1. Don’t you just hate when you have to squeeze and shake the container to get the condiments out and in most times you end up squirting ketchup all over yourself? Yes! 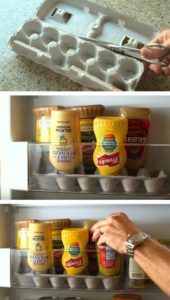 This is exactly why using a recycle egg carton can help you store your condiments, pour easily and avoid a mess. via Bob Villa. 2. Sometimes our freezers don’t come with bins or partition and this just causes a cluttered fridge and makes it hard to store items. 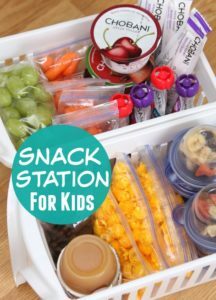 Using these plastic bins will help you to sectionalize and differentiate items while giving you more storage space. via Pinterest. 3. 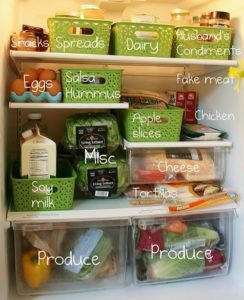 Label and organize your fridge like a boss!!! via Boom Chocolate. 4. 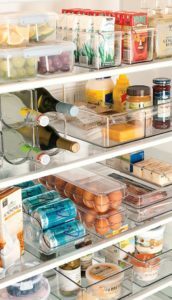 Using Egg Trays, wine racks and storage bins can help alleviate a cluttered fridge and instantly giving it a face flat. 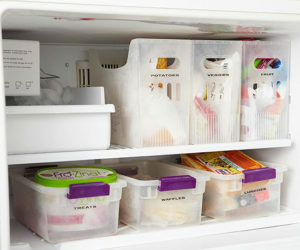 You can grab this set of fridge and freezer organization and storage bins here on Amazon set via Container Store. 5. 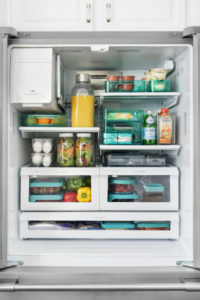 I just love how The Glamourous Housewife neatly organize her fridge with these green baskets. 6. Squawk Fox have put together an infographic that shows you exactly how to store food in the right spot. 8. I admire At home with Nicki her home is gorgeous just take a page out her book. Doesn’t it look like something ou the magazine? 11. How cool is it to have air space in your fridge? These magnetic bottle holders are perfect if you love beer, but of course, they can be used for other purposes. You can get these magnet strips here at Amazon. I just had to share this idea. 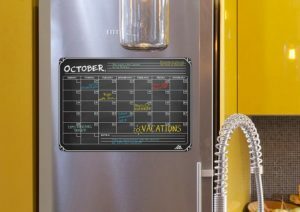 Magnetic Chalkboard Calendar. How do you like these ideas? Can you implement any of them or do you have better ideas? Let me know in the comment down below?